Iraqi Forces Reportedly Enter Besieged Northern City Of Amerli : The Two-Way The town of Amerli, which includes some 20,000 Shiite Turkmen, has been surrounded by Sunni Islamic State fighters for two months. 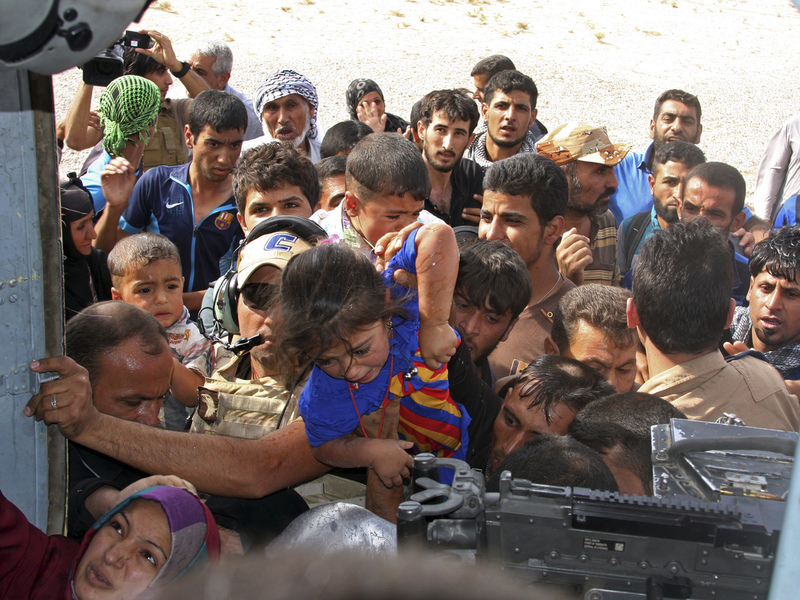 In Amerli, people try to board an Iraqi Army helicopter aid flight bringing in supplies to the town on Saturday. The town, which includes some 20,000 Shiite Turkmen, has been surrounded by Sunni Islamic State fighters for two months. 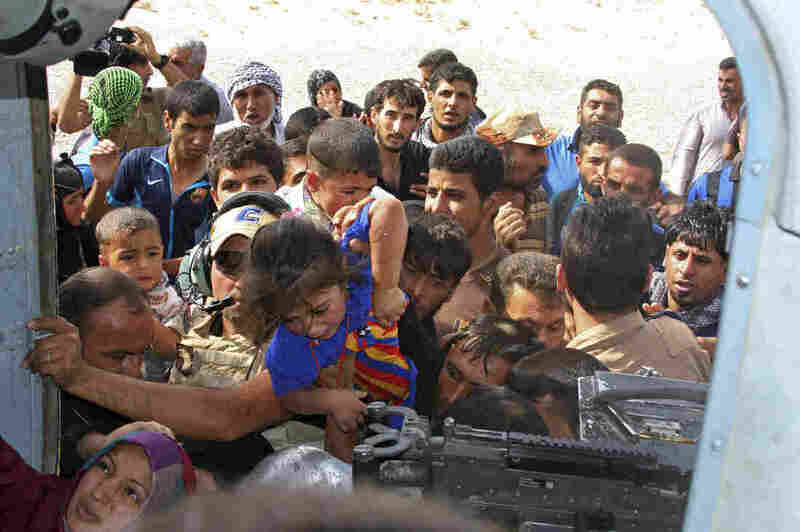 Iraqi security forces backed by Shiite militias and U.S. airstrikes have reportedly entered the northern town of Amerli, where Islamic State militants have laid siege to the town for weeks, prompting fears of a sectarian massacre. Reuters and BBC report that Iraqi Army and volunteer fighters entered the town on Sunday after defeating the Sunni rebels, also known as ISIS or ISIL, east of the city. The Islamic State, which claims to enforce a pure version of Islam, has apparently targeted Amerli because of its large Shiite Turkmen population, seen by them as apostates. Reuters say fighting continues to the north of Amerli. NPR's Peter Kenyon, reporting from Erbil, says that as Iraqi forces began the push into the city, U.S., British, French and Australian humanitarian aid drops were also carried out alongside American airstrikes against the militants. He says that Amerli has held out against the Sunni extremists for two months, but has been unable to break the siege. "At long last, residents are seeing an effort to help them," Peter says. "The Pentagon says U.S. aircraft carried out airstrikes against Islamic State targets near Amerli." "The Islamists control more than 30 villages surrounding the town," he says. Peter, in a report for Weekend Edition Sunday, spoke by telephone to a security guard inside Amerli. "I spend all night at the front guarding the town with my friends, to protect our families," the guard said. "In the morning we come home and try to sleep and another group takes the guard." "We sleep until it gets too hot, because there is no electricity. Certain houses cook the food — if you get lunch, you don't get dinner, and if you get dinner, no lunch," he says. "Also everyone who smokes gets three cigarettes a day; we don't have many." "The operation to reach Amerli began on Saturday when an alliance of Iraq government forces, Shia militias and Kurdish Peshmerga began a two-front attack on IS positions. "Reports described it as the biggest military operation since IS began making major gains in Iraq in June."